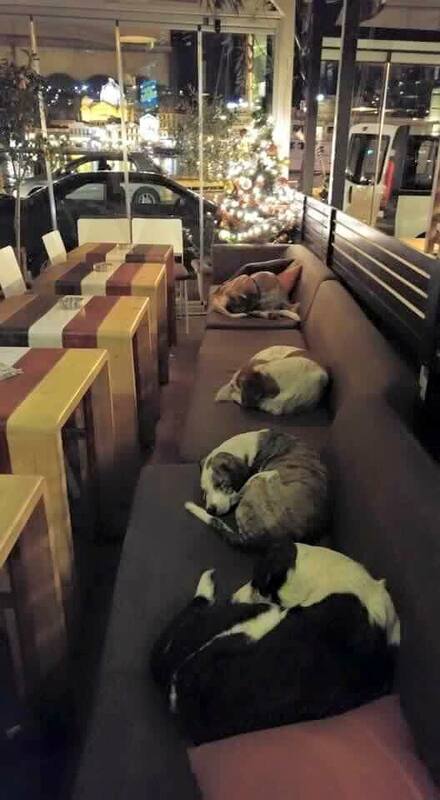 A photo of several stray dogs sleeping inside a Greek cafe is touching dog lovers’ hearts around the world after it was posted to social media. The picture shows a group of street dogs napping on the cushioned benches of the coffee shop after the business owners open their doors every evening after closing shop. The cafe, Hott Spott in Mytilene, Lesbos, lets the local stray dogs in so they can use the sofas and sleep without getting cold. They have been sleeping at the cafe since the summer, according to The Independent. Street dogs in Greece are monitored and managed differently from other European countries. The dogs are often microchipped, vaccinated, neutered and spayed when possible and collared and cared for by the community at large. This is done rather than having the dogs corralled and put into crowded shelters. One street dog named Sausage became a household name in Athens, Greece a few years ago after he marched alongside demonstrators during the country’s economic crisis. “In most European countries, they solve this problem [of stray dogs] with euthanasia. But Greek culture is against that. It would seem that this cafe in Lesbos is doing just that! Share this touching act of kindness with your family and friends! 16 Coffee Facts That Will Make Your Next Cup Taste So Much Better. How to make sago at gulaman?